Music of Jewish and Yiddish origin for voice, harmonica, violin, cello, and piano. 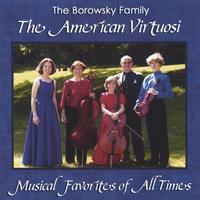 Original compositions for violin, cello, and piano by the American Virtuosi is finally here! This CD includes Postcards from Dilsberg, Music from Around the World, HARDY, In Memoriam, These Three Remain, and Northern Lights. Their compositions have been praised by audiences around the world for their fresh harmonies and powerful messages. Elizabeth, Emmanuel, and Frances Borowsky perform Ludwig van Beethoven's Triple Concerto as soloists with the Young German Symphony Orchestra. Live performance The Majestic Theatre in Gettysburg, Pennsylvania. Available through IntermuseArts. "Postcards from Dilsberg" is a collection of five musical postcards portraying the history, legends, and people of Dilsberg, Germany. The music was composed in by the Borowsky Trio during their residency at the historic Dilsberg Castle. The DVD includes scenic photos . Available through IntermuseArts. "Musical Favorites of All Times" presents a unique selection of piano, cello and violin music, suitable for listeners of all ages and tastes. In addition to works by time honored composers Bach, Bloch, Chopin, Chaminade, Ginastera, Grieg, Kreisler, Liszt, and Paderewski, it includes compositions by Elizabeth Borowsky. Performers: Elizabeth Borowsky (piano), Emmanuel Borowsky (violin), Frances Grace Borowsky (cello), and Cecylia Barczyk (cello). Available on CDBaby and Amazon.com and through IntermuseArts. 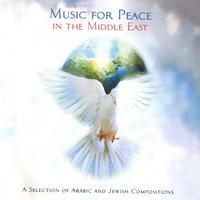 This CD presents a unique collection of Arabic and Jewish music performed and recorded at the Towson University International Cello Festival y renowned American, Arabic, and Jewish musicians. Available on CDBaby and Amazon.com through IntermuseArts. Many respected music critics consider the works presented on this CD as precious pearls of violin and piano music. Recorded by Emmanuel Borowsky at age 11, with his 15 year old sister, Elizabeth. Available on CDBaby and Amazon.com through IntermuseArts.